Landaas & Company newsletter, January edition now available. U.S. manufacturers said they expect their greatest growth in two years, according to the December ISM Manufacturing Index. Purchase managers in the monthly survey were more optimistic than analysts had expected, saying new orders were growing at their fastest pace since the end of 2014. The index suggested the fourth consecutive month of expansion for manufacturing, which has been beset by weak global markets and disadvantageous currency exchange rates. An industry much less dependent on conditions abroad showed continued strength in November. Construction spending hit an annual rate of $1.18 trillion, the highest since April 2006. 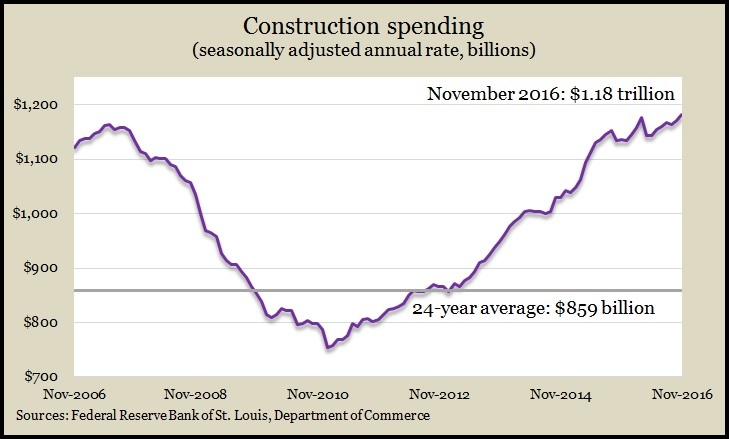 The Commerce Department said the pace was up nearly 1% from October and 4% from November 2015 led by residential building, lodging, churches and schools. The sales pace of motor vehicle sales – a key component of consumer spending – reached 18.4 million in December, capping off the best year since before the recession in 2006. Manufacturer reports gathered by Autodata Corp. showed sales up 5% from December 2015, led by imported trucks, which are benefiting from lower gas prices and favorable exchange rates. The moving four-week average for initial unemployment claims dropped for the second week in a row, an ongoing sign that employers overall are reluctant to part with their workers. The Labor Department reported that jobless numbers remained below the 50-year average, where they have been for four years. Service businesses expanded in December, at the same pace as in November, which was the strongest month in 2016. The Institute for Supply Management Non-Manufacturing Index showed the largest sector of the U.S. economy growing for the 83rd month in a row. Employers added more than 2 million jobs in 2016, the sixth year in a row of such gains and the longest streak since 1999. The Bureau of Labor Statistics reported that December job gains fell off the pace of recent months and years. The unemployment rate ticked up to 4.7%, still considered by some economists as a sign of full employment. The average hourly wage rose 2.9% from December 2015, which could encourage greater consumer spending. The U.S. trade deficit grew to its widest gap in nine months in November, the Bureau of Economic Analysis said. Much of the widening came from an increase in the volume and price of imported petroleum products. Imports rose 1.1% from October. Exports declined 0.2%, reflecting the ongoing struggle to sell U.S. goods abroad because of the strong dollar. The Commerce Department reported that factory orders fell 2.4% in November, the first decline in five months. Excluding volatile commercial aircraft contracts – which led the declines, orders rose slightly but remained 2.2% below the year-ago pace. Another measure in the report suggested a second consecutive month of increased business investments, although such spending was down 3.8% year-to-year.